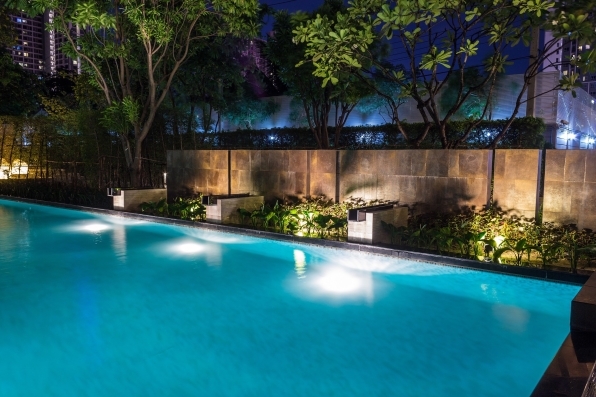 The best pool landscaping ideas incorporate smart, functional and stylish design, including plenty of greenery, non-slippery surfaces and creative zoning for poolside fun and entertainment. The aim of every pool landscaping project is going to be different for each home, but we all want attractive, inviting, low-maintenance landscaping, that creates an ambience and offers privacy around our pool. Whether your swimming pool is brand-new or an older part of your outdoor landscape, creating an oasis surrounding your pool is just as important as the design of the pool itself. Bring your pool landscaping ideas full circle with surrounding garden filled with beautiful trees and plants, utilise stylish poolside furniture and consider additional factors such as privacy, shade, and safety. Paving leading up to and surrounding your pool plays a huge part in the overall appearance of your pool area providing a clean, non-slip surface to keep dirt and debris from the water. A few minor accents can turn a traditional backyard into something truly spectacular. Pops of coloured or mosaic tile add permanent and low-maintenance character to a backyard. A pool should be a versatile centrepiece to your backyard. Be sure to design for all the ways you plan to use the space by installing a large and spacious surrounding deck full of opportunity. Multiple zones can be created through smart design elements and landscaping. Think outdoor kitchen, comfy lounges for the zen day spa, slides and splash zones for the kids or a separate poolside outdoor living room all complemented by lush plants. Oversized outdoor table umbrellas do double duty in shielding you from view and the sun’s rays. Include outdoor rugs in your furniture arrangement to define these multi-zones. Pool pavilion is basically a fancy way of saying pool room – usually detached and self-contained from the house. Various styles such as Balinese, Hamptons or the classic beach shack can be considered then finish styling with lounges, outdoor tables and chairs, a bar or an outdoor BBQ/kitchen. Relief from the hot sun in the form of trees, shrubs, or manmade structures is a must-have when it comes to pool landscaping. Besides offering an escape from the heat, they often create a focal point for the space. Make time spent in your pool feel like a small adventure. Install bridges, fountains, lazy rivers, and activity zones – swimming turns into non-stop fun for all ages. Complete your pool project with landscaping to match–playful paths, decorative rock, and a luxurious cabana. Every day can be an adventure in your own backyard. If your backyard is set in a place of natural beauty, integrate your pool into that space. Use local rock, stone, wood, and plants to incorporate your pool seamlessly with the space around it. Line the bottom of your pool with decorative pebbles or river rock to add to the natural look and feel of your pool area. A pool area requires somewhere to lounge, swim and relax. A daybed or sun lounge works perfectly and colourful cushion covers, pillows, drapes or umbrellas can easily brighten up the area or carry the design theme from inside to outside. Starting pool landscaping from scratch certainly has its advantages. But that doesn’t mean you can’t redo an old pool landscape using the same plant suggestions and tips. As a key element include a little corner or small bed of plants to break large stretches of hard surfaces. Pots with your choice of plants are a simple way to make a low-cost impact and brighten up your pool area. Pots should match the scale of your pool and tall, structural plants provide contrast to the large horizontal expanse of water and paving. A good pool landscape will have all kinds of floral interest, drama, and height. Creating a sense of privacy around a pool or spa is important. After all, your pool is meant to be an oasis and it’s not easy to relax if you feel exposed. Trees, shrubs, tropical plants, screens and fencing are all options to provide a little seclusion. If you’re interested in discussing how Fresh Perspective Landscapes can turn your pool into an absolute haven please contact Luke now or visit us on Facebook. N.B. If you are looking to install a pool we have qualified pool builders that we work with and recommend with our landscape designs.